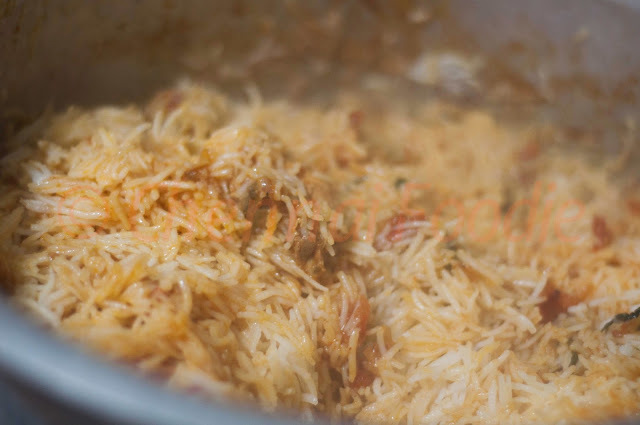 I'll admit - I have been unfair to most biriyanis in town (or out of town), sometimes going to the extent of calling it Tomato rice - which most believe is the biggest disgrace to a biriyani or the dirtiest word in the dictionary to call a biriyani. Yes, sometimes, some of them deserved it and other times may be not, but yes, unfair would be an understatement! So I am out to discover the biriyani in its various forms. Let us accept the fact that biriyani has been around for so long that it is only natural that it gets localised, retaining just its essence! So what distinguishes the good ones from the bad? Which ones deserve to be called Biriyani and which ones deserve to be called Tomato Rice? After looking around at most possible sources, Biriyani seems to have originated from around Iran (modern day Persia)! 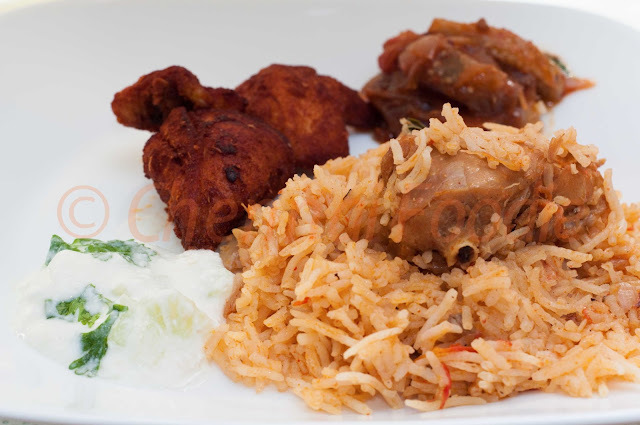 Biriyani comes from the Persian word 'birian' or 'beriyan' which literally means 'fried or roasted before cooking'. However there is always a reference from our Tamilian sources taking some credit for whatever is done wherever in the world and this time it is 'Oon Soru' a reference from as early as 2 AD, in a number of Tamil Literature and Oon soru was supposed to be made with rice, ghee, coriander, pepper and bay leaf. There are also references of biriyani being created to feed soldiers which had the rice to provide energy and also the meat and vegetables to balance nutrition and the spiced to make it tasty enough to make them eat. There are also references to biriyani being created for the poor man who one day decided to mix the rice, gravy meat and vegetables to make it easier to eat it all quickly and go to work, but in general all this seems to have happened some where around Iran. But, I guess, for all practical purposes, the Biriyani's migration to India can be credited to the Mughals. The best way to try and make out all those difference is to know how a biriyani is made! 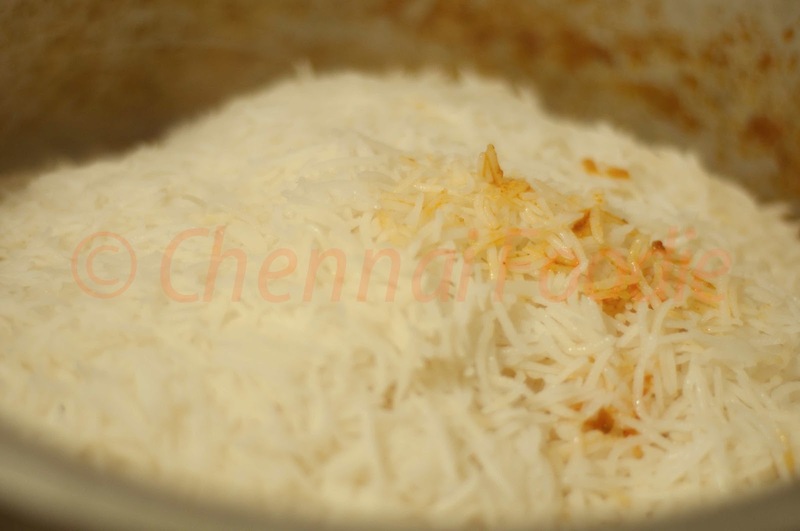 Yes, there are many variations, but the basics of making a good biriyani needs to understood! And so, my journey started from the one place where I could see it being done from scratch - home! The biriyani made at home is one that I grew up eating a lot (I am pretty sure you knew that information) and one that my friends love to come home for. The biriyani at home has always been a hit, which is why I am starting from here. It gave me important insights which I am sure will come in handy when I try to differentiate biriyani from tomato rice! Over the next couple of months, I intend to understand this wonderful dish inside out - Join me! So here is how biriyani is done at home! You will need a large vessel that can accomodate all of this. The pictures below were not designed to look good but to show you the exact colour of the cooking process and almost represent it the way it looked when it was being cooked. So take the large vessel and put in on the source of heat - a gas stove or wood fire or whatever! Once it is completely dry, the ghee can go in and wait till it get nice and warm. 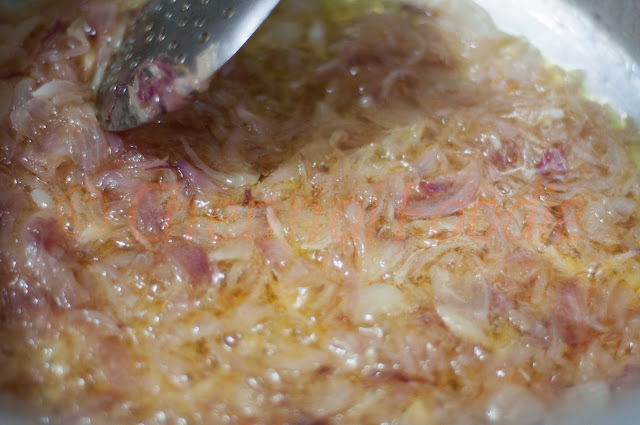 Now add the sliced onion and cook till they become transparent and slightly roasted. Depending on the heat, this process might take anywhere between 5 and 15 minutes. "The thinner the onion is sliced the better - you know the surface area is more and the onions add a lot of flavour to the biriyani, so make it very thin" says the mom, the chief cook! "See this colour, wait till it gets to this" she says as she points out the onion in the vessel. On a rough estimate, the onions became almost half the quantity when the colour she was looking out for surfaced. Now she put the rice in water and left it to soak. "For this much rice, it must soak for about 15-20 minutes" she said. "Now you have to add the spices" she says as she drops the cinnamon, cardamom and the cloves inside the vessel. "See, once you add these, the onions will stop cooking, so the onions have to be perfect before you add this. If you add this before the onions, then the onions will also have the flavour of these spices and the flavour of onion will be less" she explains as she stirred what was inside the vessel! After a couple of minutes, she put the ginger garlic paste in and continued stirring and after another couple of minutes the tomatoes went in. "Maybe some of these hotels add tomatoes first or don't put the spices before the tomatoes which is why it might taste like tomato rice" was her explanation of tomato rice biriyanis. How much of this technicality affects those biriyanis, I am not sure, but it was good to know. And so the tomatoes kept cooking and cooking till they started reducing. "This is when the meat must go in" she said put the 1.25 kg of cut chicken. "If you put mutton, then the gravy has to cook for longer, so you can keep the heat a little lower. Also for mutton, if you are making at home, then you could cook it in a pressure cooker and then put it in this gravy" she said. In a separate vessel, she put the soaked rice into boiling water. After about 15 minutes of stirring, the uncut chillies and the red chilly powder went in with the curd. "Some how home made ginger garlic paste and home made red chilly powder seems to affect the biriyani. If I use the ready made ones, all of you complain about the biriyani." she said with a smile. "Curd is optional, but I always add it" she added. This is also the time the mint leaves and the coriander leaves went into the vessel. "If you made it correctly, then by this time, the chicken would have cooked perfectly. If you did not follow time correctly or quantity, then the chicken would not have cooked and gravy will start to reduce too much. If that happens, pour little water, but right now it is perfect" she showed the vessel with the cooked chicken in a greatly reduced gravy with a sense of pride. The gravy was a dark orange. "By this time the rice is also cooked. You must time it correctly so that the rice is cooked just when the biriyani gravy is ready. If you leave the rice to rest and get even little cold, then the biriyani will not taste as good." It was time to now place the cooked rice on top of the gravy and keep it warm to prevent it from overcooking and giving the "dhum". For that at home, she took a tawa, put it on the fire and then kept this biriyani vessel on top of it. The rice was placed on the gravy and kept on the tava for a little while till we were ready to eat. The vessel was now removed from the stove and placed on the floor where the mixing process began. "Put the spoon to the base and mix from down to up, not in a stirring movement" she said and I was not sure how much of a difference it made, but once the biriyani was mixed and served with the Chicken 65, the brinjal gravy and the cucumber raita, it was heavenly!!!! After all the hard work (yeah watching biriyani being made with all the brilliant smell and not able to eat that smell IS HARD WORK), we ate! I ate 3 full servings and was stuffed to the nose!!!! Let me know if you need the recipe for the chicken 65 and brinjal because both of them turned out to be great as well, but is not very difficult to make and the recipes are available on the net. The chicken was not dry like it happens in most places but was juicy! The curd makes a load of difference. But this is the anatomy of a biriyani, the basis of this wonderful dish. So now that the base is covered, variations (and poor imitations) can now be identified. 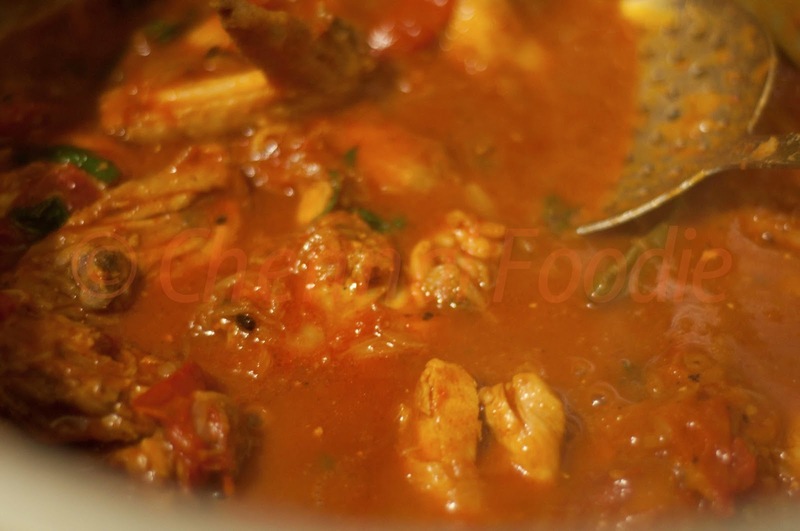 Keep checking out this space for the next biriyani recipe coming from another home cook, this time Urdu Muslim style! 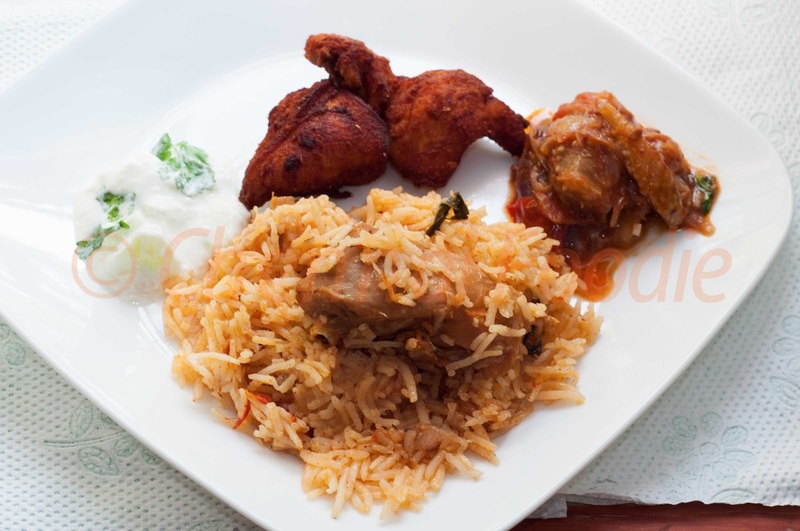 * For the research on the origins of biriyani, similar information was found on a number of blogs, websites all of them taken from other websites and blogs, so there is no one particular blog or website to give credit to. Thanks to everyone who helped me get this information.